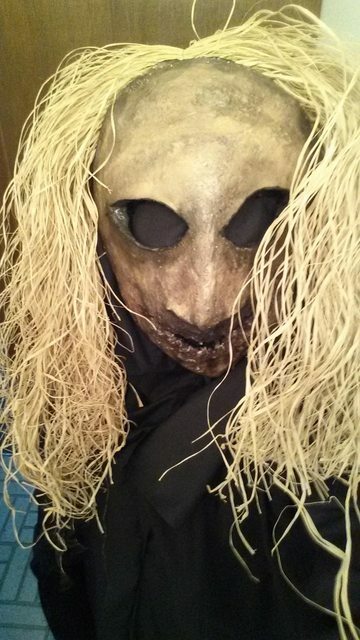 Continued from the last two weeks, here is the final installment of The Witch Mask. With the witch mask exterior painted and sealed, the internals were applied. The interior was painted black with acrylic paint and sealed with Mod Podge. I wanted to avoid using a strap around the back, as I have found that is unreliable for keeping things on without slipping. Instead, I opted to use a hat. 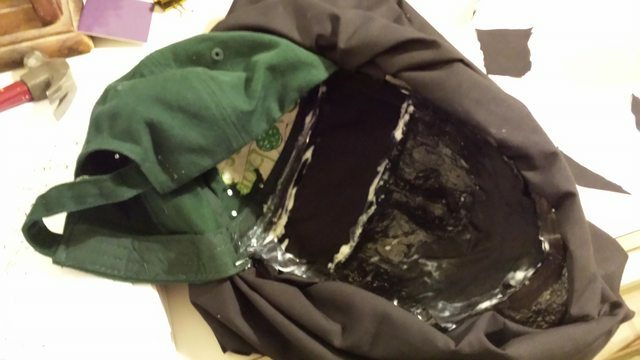 Cutting the bill off of a baseball cap, the fabric was glued in place with hot glue. Sheer black fabric was placed over the mouth and eye holes, as pictured below. When pulled taut, this allows the wearer to see through the fabric while not allowing others to see the eyes. The fabric was glued in place with PVA. To keep the fabric taut, masking tape was used while the glue was drying, and it was removed upon completion. A hood was sewn to fit around the mask. Made from black cotton quilting fabric, the forward opening of the hood fit directly to the mask edge. This was secured with hot glue. Remaining black cotton fabric was sewn into an impromptu robe. 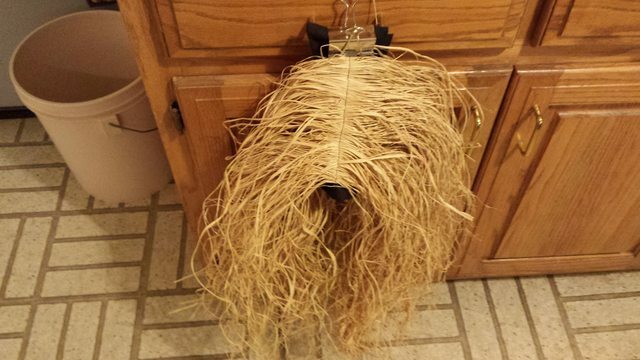 A nest of hair was made for the witch mask. The material I chose to use was raffia. This fiber is produced from the frond of the raffia palm. While you might have seen this material used in twine or hats, it is also used in traditional African tribal masks. The raffia fibers were combed parallel to each other and folded in half. Along the fold, a double stitched seam was sewn to hold the fibers together. The stitch distance was short enough to penetrate most of the individual fibers so they would be retained during use. 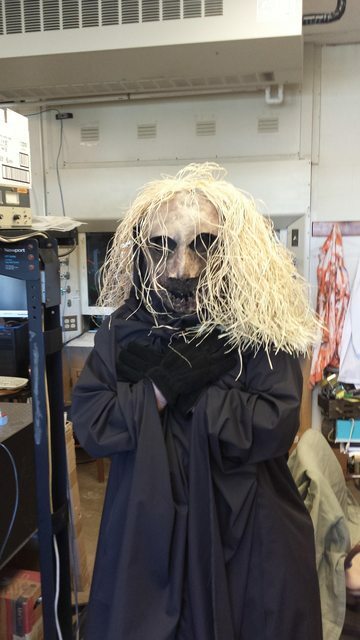 The hairpiece was secured with staples to the paper mache portion of the mask and sewn onto the black hood with some quick stitches. Pictures of the completed mask can be seen below. The lighting isn’t great, and the photos don’t capture dark, unnerving quality this has. I blame my old phone for the poor picture quality. As you can tell from the previous photo, I made the mask into a complete Halloween costume. Since I’m an adult, I naturally decided that I would wear the costume around town. On my walk to work, I received plenty of stares. The best part was when I took the elevator to my office. I got on the elevator, let the doors close, and squatted in the corner near the buttons. I did not speak. The next few times someone would come on the elevator, I would slowly arise from my squatting position to my full standing height. Eventually, someone went to my floor, and I got off to get some work done, but not before I scared one of my colleagues so badly, he refused to take the elevator. On my way home from work, took the same path back. Possibly my favorite reaction occurred when I passed by the library and two guys started shouting at me about how scary/awesome I was. I ignored them for a beat, stopped, and turned my mask toward them while keeping my body rigid. They screamed like little girls and ran off, the perfect reaction. I noticed two people running towards me at one point. One held a camera, the other a microphone. They were interviewing people on campus for a Halloween special. I was very excited to be interviewed. Yet, my commitment to staying in character is very strong. I remained silent. All the microphone would pick up from the witch mask’d man was a deep rasping of breath. 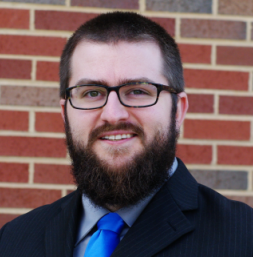 The only motion I made to the camera was a slight tilt of my head, staring directly forward. The interviewers loved this, but I could tell they wanted more. After about 5 minutes of footage, I just walked away. Since Halloween fell on a Friday that year, there were loads of parties around town. I decided that the witch mask needed to go make some friends. I stopped at my usual bar at one point, and I just stared at the bouncer. Later, talking to him, I found out that this actually freaked him out pretty bad. At the time, he remained stalwart, laughing off the fear and asking for my ID. Since I forgot my wallet at home, I decided I didn’t need a drink that night. No, the fear sweat would sustain me. My last stop was a fraternity/sorority party at a house near my apartment. I stood outside on their lawn while I could see them staring at me through the blinds. As the watching individual turned to tell her other scantily clad friends about the creepy thing in the yard, I would dash forward and freeze, mimicking schoolyard red-light-green-light games. Eventually, I made it up to their door, and they were truly terrified. I stood there, and I was about to leave when some guys came out and confronted me. One pulled my mask off, which I found rude, but I suppose I can’t complain since I was being creepy. Leaving with a “I’ve been kicked out of better parties than this”, I decided to end my night. To this day, the Witch Mask hangs on my wall. A solemn visage to give visitors pause when they enter my home – a real conversation starter.